Donald J. Trump is smashing an enmeshed political spoils system to bits: the media complex, the political and party complex, the conservative poseur complex. You name it; Trump is tossing and goring it. The well-oiled elements that sustain and make the American political system cohere are suddenly in Brownian motion, oscillating like never before. An entrenched punditocracy, a self-anointed, meritless intelligentsia, oleaginous politicians, slick media, big money: These political players have built the den of iniquity that Trump is destroying. Against these forces is Trump, acting as a political Samson that threatens to bring the den of iniquity crashing down on its patrons. It is this achievement that the author of The Trump Revolution: The Donald’s Creative Destruction Deconstructed cheers. By drastically diminishing The Machine’s moving parts, the author hopes Trump might just help loosen the chains that bind the individual to central government, national and transnational. In the age of unconstitutional government—Democratic and Republican—this Trumpian process of creative destruction can only increase the freedom quotient. We inhabit what broadcaster Mark Levin has termed a post-constitutional America, explains ILANA Mercer. The libertarian ideal—where the chains that tether us to an increasingly tyrannical national government are loosened and power is devolved once again to the smaller units of society—is a long way away. In this post-constitutional jungle, the law of the jungle prevails. In this legislative jungle, the options are few: Do Americans get a benevolent authoritarian to undo the legacies of Barack Obama, George W. Bush and those who went before? Or, does the ill-defined entity called The People continue to submit to Demopublican diktats, past and present? The author of The Trump Revolution contends that in the age of unconstitutional government, the best liberty lovers can look to is “action and counteraction, force and counterforce in the service of liberty.” Until such time when the individual is king again, and a decentralized constitution that guarantees regional and individual autonomy has been restored—the process of creative destruction begun by Mr. Trump is likely the best Americans can hope for. “A timely and remarkable book.”—LESLIE JONES, Ph.D., editor at Quarterly Review, the celebrated British journal founded in 1809 by Walter Scott, Robert Southey and George Canning. “Trump indeed has proven to be a force of nature. Yet so too is Ilana Mercer. … The Trump Revolution is the first libertarian defense of the Trump Process. 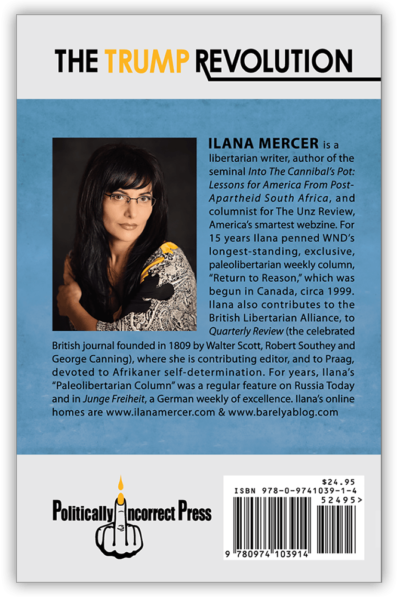 Mercer, being as much an enemy of neoconservative Republicans as she is of leftist Democrats, treats audiences of all political persuasions to a work that is above suspicion. The Trump Revolution is especially suited for libertarian and conservative-leaning Trump skeptics. Mercer, a paleolibertarian—i.e. a libertarian who doesn’t live in a pseudo-Platonic dream world of abstractions—is as concrete as can be within her opening statement, appropriately subtitled: ‘Welcome to the Post-Constitutional Jungle.’ As Mercer reminds us, in a post-Constitutional jungle, ‘a liberty-lover’s best hope is to see the legacy of the dictator who went before overturned for a period of time.’ Over the span of 252 pages, with an astuteness that escapes most contemporary popular writers whose partisanship binds them to stock phrases and crusty categories, Mercer reveals once more her originality as an analyst to ‘deconstruct’ how Trump has waged a campaign against sacred cows … ‘progressive’ and ‘conservative’ alike.—JACK KERWICK, Ph.D., ethicist, political philosopher, columnist at Townhall.com & FrontPage Magazine, author, The American Offensive: Dispatches from the Front. In ‘The Trump Revolution,’ Mercer gets at precisely what I would like people to understand relative to the Trump phenom. ‘Donald J. Trump is smashing an enmeshed political spoils system to bits,’ she writes, and indeed, this system and the necrotizing societal parasites who benefit from it deserve, in the moral sense, to be smashed, and must be neutralized … Perhaps it is the scary-smart Mercer’s status as a non-conservative ideologue, or as a non-native to America, that made her uniquely qualified to write this book.—ERIK RUSH, syndicated columnist, author of Negrophilia: From Slave Block to Pedestal-America’s Racial Obsession. 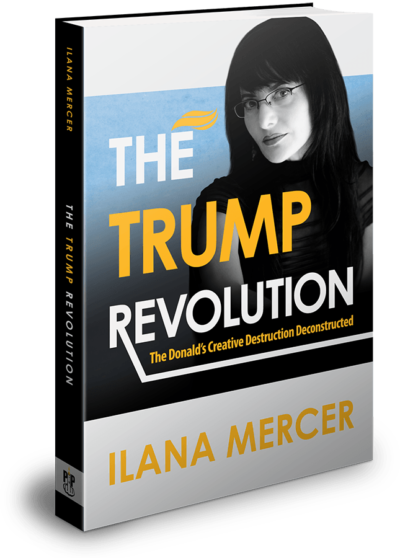 “The passionate and stunningly articulate Word Warrior Ilana Mercer explains why Donald Trump has given new hope to millions of Americans demeaned,disparaged and discarded by elites who comprise ‘the New York-Washington axis of power.’ She truly understands why Trump’s message is resonating with millions of frustrated, disenfranchised citizens, and gives voice to their gut-level angst: ‘For now, it’s safe to say Donald J. Trump is breaking stuff that needs breaking. '”—WILLIAM B. SCOTT, novelist, consultant, retired Rocky Mountain Bureau Chief for Aviation Week & Space Technology, former flight test engineer, recipient of 17 editorial awards for excellence. “The Trump Revolution isn’t slobbering, sleazy ‘slash’ fiction, with ‘Trump’ and ‘America’ in place of ‘Kirk’ and ‘Spock.’ Mercer is candidly critical of Trump throughout, but views him as a long-overdue catalyst for change.”—KATHY SHAIDLE, author, columnist for Taki’s Magazine, blogging pioneer since 2000, editor of FiveFeetOfFury.com.